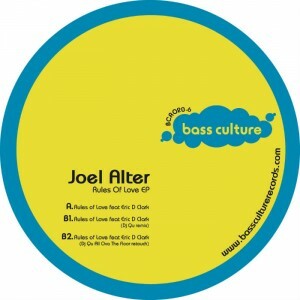 Book-ending a successful 2011 for Bass Culture Records, the label return to Swedish producer Joel Alter, who’s January release the “Silence Is Golden” ep, remains one of the most popular and successful releases to date for D’Julz’ impressively strong imprint. Having spent a vast amount of 2011 collaborating on new music with Henrik Jonsson, including their debut long player, “Mod” released in October on Kontra-Musik, Joel flies solo again on BCR020, his “Rules Of Love” ep. Featuring the silky yet questioning tones of Erik D Clark on vocals, the title track ploughs a deeper path than some of Bass Cultures recent releases. The production is very much ‘less is more’ as Erik flows effortlessly from speech to song and Joel sweeps us along with his popping bassline and open hats. DJ Qu has been on the remix target list of BC boss D’Julz for some time now and to have him lend his talents to reworking “Rules Of Love” was always going to be a perfect match. The New Jersey native and Strength Music chief leads the original into sleazier territory. This is a darker place, where the ceilings are low and drip with sweat. Where the strobe is the only light and the walls throb with Qu’s gut wrenching bassline. When Franck Roger received the promo of Bass Culture new release by Joel Alter “Rules Of Love EP“, he fell in love so much with the original that he contacted D’julz straight to get the parts of the track and turned the dark & deep original into an ecstatic house monster. The track will be added as a digital exclusive upon the release of the EP on Beatport. This entry was posted on November 8, 2011 at 14:55 and is filed under Release.